Nam Long Group has officially announced two Flora Fuji apartment block of Fuji Residence project in the center of District 9 following the resounding success of the flora apartment project in Anh Dao Flora Fiji apartment features prominently? Should you choose to buy an apartment at the Fuji project? And why say Flora Fuji apartment is an ideal place for your family? Located in a location with complete infrastructure and crowded population is the advantage of any real estate project. Flora Fuji Apartment is a project that has such advantages. 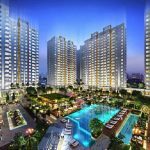 The Flora Fuji project is located in the extended Nam Long residential area in Phuoc Long B ward, Flora Fuji apartments are adjacent to Rivera Cove, just over 100 meters from the second ring road. It is just over 2 km from Hi-tech Zone and Sam Sung Korea factory. Not only that, flora Fuji apartment is located next to the highway of Ho Chi Minh City – Long Thanh – Dau Giay, which facilitates extremely convenient transportation, travel of the residents. Live here Flora Fuji apartments are easily accessible to the center of District 1 in 15 minutes or to Phu My Hung, District 7 in less than 10 minutes. Moreover, from the apartments we can expand the view because the view here is very good. Standing in the North, we can see the expressway and Vanh Dai 2 road to the high-tech district 9. Besides, standing in the East, you can see the River Terrace project right next to the existing Nam Long area, creating a luxurious and classy living space. For each project, the customers are interested in the quality and reputation of investors. This Flora Fuji project has ensured the satisfaction of every customer. The project is invested and developed by Nam Long Group – a corporation known as a solid, prestigious development group with a voice in real estate. Nam Long always confident and keep up with his goals and progress. Up to now, the Group has maintained its brand name by realizing its main goal of 23 years. This makes it even more difficult for customers, even the most demanding customers, to choose Nam Long’s projects and Flora Fuji is one of them. Any investor would like to have his project attracted much attention but apart from such factors as favorable location, time commitment, quality of the project, the utility of the apartment is also an extremely important factor that we cannot ignore. Each apartment in the Flora Fuji project is designed to be very modern, comfortable. Living room, living room, kitchen as well as bedroom system are designed and arranged to create the science in every detail. This is at comfort, comfort for each person from young to adult. Apart from the advantages from the design of the apartments, customers can easily see the fresh air, gentle due to the contiguous advantage of the river’s large project. Modern overview design without losing the harmony with nature makes a distinct mark called Flora Fuji. With a size of 6.6 ha including 84 villas and 789 apartments that convergence full of advantages, but the price of the project is very preferential, suitable for many people. Only about $44,000 for a highly rated apartment has met the needs of many people. Not only that, customers can find support up to 80% at the rate of 6.5% in 3 years from banks. The loan period can last up to 15 years. The banks that customers can look for help are many such as Vietcombank, Shinhan, HD Bank, TP Bank… not limited to a few banks. This is extremely good news for customers who are still anxious about the issue of money to decide for themselves and their families a beautiful place to build a life. A general overview of the Fuji Flora project has made many experts in the same segment did not regret offering praise. Therefore, you are still hesitant not to choose a place to stop, an ideal place as flora Fuji apartment. Let your life be promoted by the Flora Fuji project to a new height. What Is Special About Valora Kikyo Villa?